Irish twins John and Edward Grimes - otherwise known as Jedward - tweeted this photo of them celebrating with Eurovision Song Contest winner and Swedish singer, Loreen after the show. Irish twins John and Edward Grimes - otherwise known as Jedward - couldn't improve on their eighth place scored in last year's Eurovision Song Contest. They came 19th despite an enthusiastic performance of Waterline, which saw them singing around a fountain in the middle of the stage and jumping into it at the end of the song. The duo reacted to the night on Twitter: "We have the Best fans in the World" and "Thank you to everyone you are all our winners! Jedward fans!" 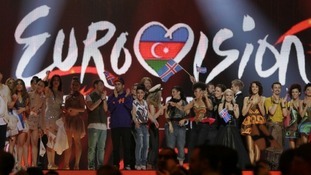 Britain have finished in 25th position out of 26 countries in the 2012 Eurovision Song Contest. Singer Englebert Humperdinck received 12 points to secure the second-from-bottom place, which was five more than Norway (7). Jedward came 19th with 46 points. 28-year-old singer Loreen has won the 2012 Eurovision Song Contest for Sweden with her song Euphoria. She amassed a total of 372 points to secure Sweden's fifth Eurovision Song Contest win overall. Britain has so far only managed to get one point in voting at the Eurovision Song Contest. 25 out of the 42 countries have given their votes. It puts Britain in last place as things stand. The Jedward song ever. Definitely gets my vote tonight! So many good 80s jumps in the air!